Nitrogen fertilizer is an important input to crop production but selecting the right rate for N in cereal and oilseed crops is a tricky business. The amount of in-crop mineralisation is often uncertain, as it depends on soil moisture, soil temperatures and the type of organic matter present. Depending on how much labile (or active) soil organic matter is present and the conditions, mineralisation may supply very little or as much as 100 kg N/ha or more to the N budget for a wheat or canola crop. While he test area does not need to be a strip (it could be a patch 3*3 m), a strip helps identify spatial nutrient patterns rather than just at one spot. The use of an N-rich strip in a paddock will allow you to follow N supply in-crop and to see what responses are likely to additional N. It is not a yield trial but an indicator of the response to extra N.
What is an N-Rich strip? A N-rich strip is a part of the field that has had additional N applied, amounts above the base rate application. This provides a reference area where any a response can be seen. Because both in and out of the strip have the same amount of mineralisation and have been through the same environmental conditions, any differences can be attributed to the higher N supply in the strip. Where to put an N-Rich strip? If interested in managing the paddock as a whole, then run a strip across a typical part of the paddock. Use a GPS to record the position, or some visual markings in the paddock. If the paddock is to be zoned for different N management strategies, then run the strip across these areas so that the responses can be seen in those zones. This can help identify the right places for N application. How to set up an N-Rich strip? Before or after sowing, an additional strip of N fertilizer is applied across the paddock. This strip need only be a combine or air-seeder width (solids) or a boom spray (fluid), and the rate can be 50 to 100 kg N/ha, and maybe 100 to 300 m long - it depends on the variability of the soil in the paddock and the sort of information the grower wants - site specific or general. Applying with a boom – maybe mounted on a 4-wheel motorbike – can be quick, and you can do a strip up the paddock and then overlap half the boom width coming back to give two rates. How to monitor an N-Rich strip? As the crop grows, this N-Rich strip will give a reference to what response could be expected from additional N fertilizer in this paddock and in this season. The strips should be read at the very start of stem elongation, as at that time the responses to added N are likely to be more effective than later applications. 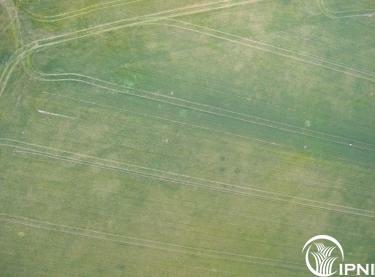 The strips can be monitored visually or using hand-held or tractor mounted NDVI devices. If no differences can be seen, then there has probably been enough N supplied up until that point that the added N did not give a response. If a response is indicated, then a response to added nutrient is suggested. If application goes ahead, spread over the N-Rich strip so that it still has a little more N than the rest of the paddock and so will continue to indicate any potential response. The strips also provide confidence in a decision not to apply N where there is no response seen in the strip. How are strips used in the US? In Oklahoma, the strips have been promoted for use with optical sensors, a calculator has been based on the difference between the NDVI value of the N Rich strip and the untreated strip and days from sowing to come up with a recommendation of the N rate to be applied. There is a link to a video with Dr Brian Arnall from Oklahoma State University on how they are using a sensor over N-Rich strips linked to a website to develop N recommendations. Can it be used for other nutrients? Of course, the same strategy can be applied to any test strip in a crop or pasture, such as investigating whether micronutrients or S are likely to give differences. For less mobile nutrients like P and K, the surface applications are likely to be less effective than at-sowing drilled fertilizers, so even if the strip shows up, the response to added nutrients may not be as much as when drilled. Dr Brian Arnall from Oklahoma State University has been a proponent of N-Rich strips and his assistance is acknowledged in preparing these guidelines.